The Club Penguin Newspaper Issue #387 is now available on Club Penguin. 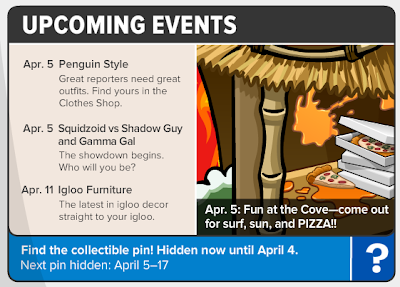 In this week's newspaper, Club Penguin mainly addresses the Puffle Party 2013, the Puffle Play Zone, the upcoming events, and the Puffle Hotel on how it was a huge success to the island. By Aunt Arctic -- Puffles everywhere are ecstatic about the Puffle Hotel. And the best part is, it's here to stay. "Shoelace couldn't wait to visit," one owner said. "She practically dragged me here!" 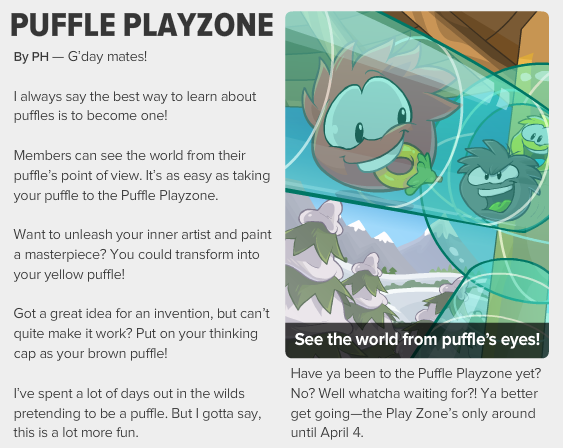 The second article in this week's newspaper mainly talks about the Puffle Playzone and how not to miss out on it because it will only be around until April 4! By PH -- Have ya been to the Puffle Playzone yet? No? Well whatcha waiting for? Ya better get going-the Play Zone's only around until April 4. April 5 - Penguin Style - What's your style? New fashions coming to the Clothes Shop soon. April 5 - Squidzoid vs Shadow Guy and Gamma Gal - Club Penguin's greatest heroes take on the ultimate foe at the Stage! The showdown begins. who will you be? April 5 - Fun at the Cove - Fun at the Cove-come out for surf, sun, and PIZZA! April 11 - Igloo Furniture - The latest in igloo decor straight to your igloo. Which upcoming events are you looking forward to? I'm excited for the Fun at the Cove as this will be a "mission" with Herbert once again. Are you excited for the Fun at the Cove or not? Leave your comments below.